Virtually all biologists now agree that bacterial cells cannot form from nonliving chemicals in one step. If life arises from nonliving chemicals, there must be intermediate forms, "precellular life." Of the various theories of precellular life, the leading contender is the RNA world. The time had come to ask how the DNA→ RNA→ protein flow of information had ever got started. Here, Francis was again far ahead of his time. In 1968 he argued that RNA must have been the first genetic molecule, further suggesting that RNA, besides acting as a template, might also act as an enzyme and, in so doing, catalyze its own self-replication. The first stage of evolution proceeds, then, by RNA molecules performing the catalytic activities necessary to assemble themselves from a nucleotide soup. The RNA molecules evolve in self-replicating patterns, using recombination and mutation to explore new niches. ... they then develop an entire range of enzymic activities. At the next stage, RNA molecules began to synthesize proteins, first by developing RNA adaptor molecules that can bind activated amino acids and then by arranging them according to an RNA template using other RNA molecules such as the RNA core of the ribosome. This process would make the first proteins, which would simply be better enzymes than their RNA counterparts. ... These protein enzymes are ... built up of mini-elements of structure. Finally, DNA appeared on the scene, the ultimate holder of information copied from the genetic RNA molecules by reverse transcription. ... RNA is then relegated to the intermediate role it has today—no longer the center of the stage, displaced by DNA and the more effective protein enzymes. Today, research in the RNA world is a medium-sized industry. Scientists in this field are able to demonstrate that random sequences of RNA sometimes exhibit useful properties. For example, in 1995, a trio at the Whitehead Institute for Biomedical Research reported "Structurally Complex and Highly Active RNA Ligases Derived from Random RNA Sequences" (4). (Ligases are enzymes that splice together other molecules such as DNA or RNA.) The results are interesting — they suggest that randomness can produce functionality. The authors interpret the results to mean that "the number of distinct complex functional RNA structures is very large indeed." There is a lot to learn about RNA, and research like this is how we learn it. But these and other similar findings, arrived at in highly orchestrated experiments that start with biologically produced RNA, are very far from proving that the RNA world is the pathway between nonlife and life. In nature, far from the sterilized laboratory, uncontaminated RNA strands of any size would be unlikely to form in the first place. "... The direct synthesis of ... nucleotides from prebiotic precursors in reasonable yield and unaccompanied by larger amounts of unrelated molecules could not be achieved by presently known chemical reactions" (5). Francis Crick himself has become much less enthusiastic about the RNA world than Watson. In 1973, he and another eminent researcher into the origin of life, Leslie E. Orgel, published a paper advocating the theory called "Directed Panspermia" (6). In 1981, Crick published Life Itself, a whole book about that theory (7). And by 1993 he says, "It may turn out that we will eventually be able to see how this RNA world got started. At present, the gap from the primal 'soup' to the first RNA system capable of natural selection looks forbiddingly wide" (8). It has been postulated that there was a time in protobiological evolution when RNA played a dual role as both genetic material and a catalytic molecule ("the RNA world"). However, this appealing concept encounters significant difficulties. RNA is chemically fragile and difficult to synthesize abiotically. The known range of its catalytic activities is rather narrow, and the origin of an RNA synthetic apparatus is unclear. A few scientists still say that DNA could succeed in starting life on its way (11). But even the shortest DNA strand needs proteins to help it replicate. This is the chicken-and-egg problem. There is a "proteins first" school. For example, Manfred Eigen of Germany's Max Planck Institute says, "There is no doubt that proteins, which are more easily formed, were first on the scene" (11.5). Of course, these first proteins must be much shorter than the ones used in life today, because of the sheer unlikelihood of forming useful long ones out of a soup of amino acids. Physicist Freeman Dyson proposes to solve the chicken-and-egg problem with a double origin, one for metabolism (proteins) and one for replication (strands of nucleotides) (12). In Seven Clues to the Origin of Life (13), A. G. Cairns-Smith says that clay crystals could have served as the scaffolding upon which the first short DNA or RNA genome was constructed. A new elaboration of this idea prompted one writer to wonder, "Primordial soup or crêpes?" (14). Even more recently, another tangent on this path leads to zeolite (14.5). Biologists Harold J. Morowitz (15), David Deamer (16), and others (17), advocate a theory that could be paraphrased as "containers first." Jeffrey L. Bada of the Scripps Institution of Oceanography holds the minority view that the early Earth was frozen and believes precellular life started in "cold soup" under the ice (18, 19). Chemists Claudia Huber and Günter Wächtershäuser say the soup where life originated was actually quite hot, probably near undersea volcanic vents, where iron and nickel sulfides might catalyze some of the necessary reactions (19.5-19.7). Cornell Astronomer Thomas Gold wonders if life might have originated in a hot environment even deeper, in Earth's crust (19.8). Stuart Kauffman of the Santa Fe Institute, says, "...whenever a collection of molecules contains enough different kinds of molecules, a metabolism will crystallize from the broth" (20). Another idea is the "PNA world." Because starting the RNA world is so difficult, there probably needs to be a pre-RNA world. PNA, or peptide nucleic acid, might have some of the properties necessary to constitute that world (21). This would be pre-precellular life. Links to several hundred more suggestions appear under What'sNEW, below. So even if we allow precellular life, there is a problem getting from there to proteins, genes and cells. The random production of proteins does not succeed as an explanation. Other intermediate, unspecified stages must be imagined. We could call these stages post-precellular life. By whatever means, life's evolution through these stages would have to be time-consuming. ...At some point RNA organisms began to dabble in the use of short peptides, leading eventually to the development of protein synthesis. Other "experiments" led to the discovery of DNA, which provided a more stable repository for genetic information. By 3.6 to 3.8 billion years ago all of these events had come to pass; the RNA world had fallen and the DNA/protein world had risen in its place. Of one thing we can be certain: The RNA world—if it ever existed—was short-lived. The earth came into existence about 4.5 x 10^9 years ago, and fossil evidence suggests that cellular organisms resembling modern bacteria existed by 3.6 x 10^9 years before the present.... There are even hints that those early organisms engaged in photosynthesis, which is likely to have been a protein-dependent process then, as now. Thus it appears likely that organisms with sophisticated, protein based metabolisms existed only 0.9 x 10^9 years after the planet's birth. The "window of opportunity" for the RNA world was much shorter than 0.9 x 10^9 years. The earth's surface was uninhabitable at the beginning due to heat generated by meteoric bombardment and its geological differentiation. ...Thus, the interval in which the biosphere could have been dominated by RNA-based life forms may be less than 100 million years. Incidentally, when one starts thinking along these lines, one must consider the unthinkable, i.e., that the length of time that RNA-based proteins actually bestrode the earth might be zero. There is no remnant or trace evidence of precellular life anywhere today. That it ever existed is entirely conjectural. Although its emergence from nonliving matter is hard to conceive, precellular life must have appeared almost immediately. There was almost no time for precellular life to evolve into the simplest bacterial cells. Precellular life has never been created in a lab. In spite of the RNA world, there is no consensus on the model for precellular life. We said that research in the RNA world is a medium-sized industry. This research has demonstrated how exceedingly difficult it would be for living cells to originate by chance from nonliving matter in the time available on Earth. That demonstration is a valuable contribution to science. Additional research will be valuable as well. But to keep insisting that life can spontaneously emerge from nonliving chemicals in the face of the newly comprehended difficulties is puzzling. It is reminiscent of the persistent efforts of medieval alchemists to turn lead into gold. Nitrogen Oxide Concentrations in Natural Waters on Early Earth by Sukrit Ranjan et al., Geochemistry, Geophysics, Geosystems; and commentary by Jennifer Chu, MIT (+Physorg.com), 12 Apr 2019. Prebiotic phosphorylation of 2-thiouridine provides either nucleotides or DNA building blocks via photoreduction by Jianfeng Xu et al., Nature Chemistry, 01 Apr 2019. From molecular to cellular form: modeling the first major transition during the arising of life by Shaolin Yin, Yong Chen et al., doi:10.1186/s12862-019-1412-5, BMC Evolutionary Biology, 03 Apr 2019. Redox and pH gradients drive amino acid synthesis in iron oxyhydroxide mineral systems by Laura M. Barge et al., doi:10.1073/pnas.1812098116, PNAS, 25 Feb 2019. ...How Surfaces May Have Helped Early Life on Earth Begin, Newswise, 28 Feb 2019. Hachimoji DNA and RNA: A genetic system with eight building blocks by Shuichi Hoshika and Nicole A. Leal, doi:10.1126/science.aat0971, Science, 22 Feb 2019. We report DNA- and RNA-like systems built from eight nucleotide "letters"... that form four orthogonal pairs. These synthetic systems meet the structural requirements needed to support Darwinian evolution. Earth First Origins Project Seeks To Replicate the Cradle of Life, Rensselaer Polytechnic Institute, 14 Feb 2019. A Prebiotic Synthesis of Canonical Pyrimidine and Purine Ribonucleotides by Hyo-Joong Kim and Justin Kim, doi:10.1089/ast.2018.1935, Astrobiology, online 30 Jan 2019. Prebiotic Oligomer Assembly: What Was the Energy Source? by David Ross and David Deamer, doi:10.1089/ast.2018.1918, Astrobiology, online 01 Feb 2019. "...evaporating pools in which a favorable entropy change is produced when high surface/volume ratios concentrate reactants at the air/water interface in continuous cycles of wetting and drying." 13 Jan 2019: If you give me 8-mers, I'll give you life. Inosine, but none of the 8-oxo-purines, is a plausible component of a primordial version of RNA by Seohyun Chris Kim et al., doi:10.1073/pnas.1814367115, PNAS, 26 Dec 2018. The Making of Life by Michael L. Wong, The Planetary Society (+PhysOrg by Keith Cooper), 18 Dec 2018. Abiotic synthesis of amino acids in the recesses of the oceanic lithosphere by Bénédicte Ménez et al. ; and commentary: The rocky road to biomolecules by John A. Baross, Nature, 07 Nov 2018. Inosine, but none of the 8-oxo-purines, is a plausible component of a primordial version of RNA by Seohyun Chris Kim et al., doi:10.1073/pnas.1814367115, PNAS, online 03 Dec 2018. New Study Reveals Common Table Salt May Have Been Crucial for the Origins of Life, Tokyo Institute of Technology (+Newswise), 29 Nov 2018. Starting from hydrogen cyanide, the one-pot synthesis of cyanamide and precursors to simple sugars in water – using gamma rays in the presence of ammonium and chloride salts – offers a way forward for engineering complex mixtures that can evolve important, potentially prebiological compounds. From Molecules to Pre-LUCA World with illustrative poster by Ulrich Schreiber and Christian Mayer, presented at the EANA Conference, Berlin, 24-28 Sep 2018. How biologists are creating life-like cells from scratch by Kendall Powell, Nature, 07 Nov 2018. The minimal cell needs only a few hundred genes to have something that looks sort of alive. Chemists find a recipe that may have jump-started life on Earth by Robert F. Service, Science, 18 Oct 2018. Ground-breaking lab poised to unlock the mystery of the origins of life on Earth and beyond, McMaster University, 04 Oct 2018. Nonenzymatic Polymerization into Long Linear RNA Templated by Liquid Crystal Self-Assembly by Marco Todisco et al., doi:10.1021/acsnano.8b05821, ACS Nano, online 03 Oct 2018. Molybdenum(VI)-Catalyzed Rearrangement of Prebiotic Carbohydrates in Formamide, a Candidate Prebiotic Solvent by Eric W. Ziegler, Hyo-Joong Kim and Steven A. Benner, doi:10.1089/ast.2017.1742, Astrobiology, online 01 Sep 2018.
Who's Who at the Dutch Synthetic Cell Symposium by Suzan Mazur, Oscillations.net, 08 Aug 2018. A Century-Old Model for Life's Origin Gets Significant Substantiation, Weizmann Institute of Science (+Newswise), 25 Jul 2018. ...lipids can exert enzyme-like catalysis, similar to ribozymes. NASA Funds Rutgers Scientists' Pursuit of the Origins of Life, Rutgers Today (+Newswise), 09 Jun 2018. Molecular Evolution in a Peptide-Vesicle System by Christian Mayer et al., doi:10.3390/life8020016, Life, online 24 May 2018. 11 Apr 2018: ...another, hitherto unrecognized environment is proposed as a site for the origin of life on Earth. Constraining the Time Interval for the Origin of Life on Earth by Ben K.D. Pearce et al., Astrobiology, online 12 Mar 2018. Horizontal transfer of code fragments between protocells can explain the origins of the genetic code without vertical descent by Tom Froese et al., Nature Scentific Reports, online 23 Feb 2018. Mineral surface chemistry control for origin of prebiotic peptides by Valentina Erastova, Matteo T. Degiacomi et al., Nature Communications, online 11 Dec 2017. Linked cycles of oxidative decarboxylation of glyoxylate as protometabolic analogs of the citric acid cycle by Greg Springsteen et al., Nature Communications, online 08 Jan 2018; and commentary: Chemists Discover Plausible Recipe for Early Life on Earth, The Scripps Research Institute (+Newswise), 08 Jan 2018. Abiotic synthesis of purine and pyrimidine ribonucleosides in aqueous microdroplets by Inho Nam et al., doi:10.1073/pnas.1718559115, PNAS, 02 Jan 2018. Phosphorylation, oligomerization and self-assembly in water under potential prebiotic conditions by Clémentine Gibard et al., doi:10.1038/nchem.2878, Nature Chemistry, 06 Nov 2017; and commentary: Scientists Find Potential "Missing Link" in Chemistry That Led to Life on Earth, The Scripps Research Institute (+Newswise), 03 Nov 2017. New Theory Addresses How Life on Earth Arose from the Primordial Muck, UNC Healthcare (+Newswise), 01 Nov 2017. Life's Late Digital Revolution and Why It Matters for the Study of the Origins of Life (Hypothesis) by David A. Baum and Niles Lehman, doi:10.3390/life7030034, Life, online 25 Aug 2017. The Origins of the RNA World, panel discussion among Walter Gilbert, W. Ford Doolittle, George Fox and Ray Gesteland at the Library of Congress, 17 Mar 2016. Nitrogen Oxides in Early Earth's Atmosphere as Electron Acceptors for Life's Emergence by Michael L. Wong et al., doi:10.1089/ast.2016.1473, Astrobiology, Oct 2017. Origin of the RNA world: The fate of nucleobases in warm little ponds by Ben K. D. Pearce et al., doi:10.1073/pnas.1710339114, PNAS, online 02 Oct 2017; and commentary: Evidence suggests life on Earth started after meteorites splashed into warm little ponds, PhysOrg.com, 02 Oct 2017. Podcast by Ralph Pudritz and Ben Pearce. Surveying the sequence diversity of model prebiotic peptides by mass spectrometry by Jay G. Forsythe et al., doi:10.1073/pnas.1711631114, PNAS, online 28 Aug 2017; and commentary: Was the Primordial Soup a Hearty Pre-Protein Stew?, Georgia Tech via Newswise, 05 Sep 2017. Was the Origin of Life a Fluke? Or Was It Physics? by Ian O'Neill, Live Science, 28 Aug 2017. Foldamer hypothesis for the growth and sequence differentiation of prebiotic polymers by Elizaveta Guseva et al., doi:10.1073/pnas.1620179114, PNAS, online 22 Aug 2017; and commentary: New Computational Model of Chemical Building Blocks May Help Explain the Origins of Life, Stony Brook University (+Newswise), 23 Aug 2017. ...Could Life Begin in Oil?, Saint Louis University (+Newswise), 16 Aug 2017. Ribosomes are optimized for autocatalytic production, by Shlomi Reuveni, Måns Ehrenberg and Johan Paulsson, Nature, 20 Jul 2017. Rather than being relics of an evolutionary past, the unusual features of ribosomes may reflect an additional layer of functional optimization that acts on the collective properties of their parts. Can life begin on Enceladus? A perspective from hydrothermal chemistry, by David Deamer and Bruce Damer, doi:10.1089/ast.2016.1610, Astrobiology, 06 Jul 2017. Experiments test how easy life itself might be, by Eric Hamilton, Wisconsin Institute for Discovery (+Newswise), 05 Apr 2017. The Emergence of Life as a First-Order Phase Transition, by Cole Mathis et al., doi:10.1089/ast.2016.1481, Astrobiology, 01 Mar 2017. Remnants of an Ancient Metabolism without Phosphate, by Joshua E. Goldford et al., Cell, 02 Mar 2017. 26 Feb 2017: ...the common ancestor ...did encode many of the protein domains of all three super-kingdoms. the origin of life, email to Ted Steele, 17 Feb 2017. Synchronized chaotic targeting and acceleration of surface chemistry in prebiotic hydrothermal microenvironments, by Aashish Priye et al., doi:10.1073/pnas.1612924114, PNAS, 07 Feb 2017. Our results suggest that chaotic thermal convection may play a previously unappreciated role in mediating surface-catalyzed synthesis in the prebiotic milieu. Crystal structure of Pistol, a class of self-cleaving ribozyme, by Laura A. Nguyen et al., doi:10.1073/pnas.1611191114, PNAS, 31 Jan 2017. 09 Dec 2016: The History and Philosophy of Origin Research (Tokyo conference report). Meteorites and the RNA World: A Thermodynamic Model of Nucleobase Synthesis within Planetesimals, by Ben K. D. Pearce and Ralph E. Pudritz, Astrobiology, online 09 Nov 2016. 01 Nov 2016: ...Then, perhaps within minutes, the first cell came into existence. A viscous solvent enables information transfer from gene-length nucleic acids in a model prebiotic replication cycle, by Christine He et al., doi:10.1038/nchem.2628, Nature Chemistry, online 10 Oct 2016. ...suggesting that viscosity-mediated replication is possible for a range of genetic polymers, perhaps even for informational polymers that may have preceded RNA. Autocatalytic, bistable, oscillatory networks of biologically relevant organic reactions, by Sergey N. Semenov et al., doi:10.1038/nature19776, Nature, 29 Sep 2016. By using small organic molecules to build a network of organic reactions with autocatalytic, bistable and oscillatory behaviour, we identify principles that explain the ways in which dynamic networks relevant to life could have developed. ...RNA World Deep Beneath the Surface, by Mary L. Martialay, Rensselaer Polytechnic Institute (+Newswise), 06 Sep 2016. Amplification of RNA by an RNA polymerase ribozyme by David P. Horning and Gerald F. Joyce, doi:10.1073/pnas.1610103113, PNAS, online 15 Aug 2016; and commentary: TSRI Scientists Take Big Step Toward Recreating Primordial 'RNA World' of Four Billion Years Ago, The Scripps Research Institute, 15 Aug 2016. Life may have emerged not once, but many times on Earth by Penny Sarchet, New Scientist, 17 Aug 2016. The physiology and habitat of the last universal common ancestor by Madeline C. Weiss, Filipa L. Sousa et al., doi:10.1038/nmicrobiol.2016.116, Nature Microbiology, 25 Jul 2016. A violent sun and a sky full of laughing gas could have led to life on Earth, by Sarah Kaplan, Washington Post, 23 May 2016. Beyond prebiotic chemistry by Leroy Cronin and Sara Imari Walker, doi:10.1126/science.aaf6310, Science, 03 Jun 2016. Progress in understanding the origin of life may come from studying how simple chemical networks can transform into living networks. Making RNA in the prebiotic world by Sidney Becker, Ines Thoma et al., doi:10.1126/science.aad28, Science, 13 May 2016. This nucleoside formation pathway can be fused to sugar-forming reactions to produce pentosides, providing a plausible scenario of how purine nucleosides may have formed under prebiotic conditions. Commentary: Building blocks for 'RNA world' made from simple ingredients by Davide Castelvecchi, Nature, 12 May 2016. Comet Craters - Literal Melting Pots for Life on Earth, Trinity College Dublin (+Newswise), 04 May 2016. Missing Links Brewed in Primordial Puddles?, Georgia Institute of Technology (+Newswise), 25 Apr 2016. Using two molecules known as barbituric acid and melamine, the researchers formed proto-nucleotides so strongly resembling two of RNA's nucleotides that it is tempting to speculate that they are indeed their ancestors. Dynamics of prebiotic RNA reproduction illuminated by chemical game theory by Jessica A. M. Yeates et al., doi:10.1073/pnas.1525273113, PNAS, online 18 Apr 2016. ...Three RNA genotypes can stably coexist in a rock-paper-scissors analog. Ribose and related sugars from ultraviolet irradiation of interstellar ice analogs by Cornelia Meinert et al., doi:10.1126/science.aad8137, v352 Science, 08 Apr 2016. The Origin of Life in Alkaline Hydrothermal Vents by Victor Sojo et al., doi:10.1089/ast.2015.1406, Astrobiology, online 03 Feb 2016 (see right). A Strategy for Origins of Life Research, by Caleb Scharf et al., doi:10.1089/ast.2015.1113, Astrobiology, 12 Nov 2015. Alexei V. Tkachenko and Sergei Maslov, "Spontaneous emergence of autocatalytic information-coding polymers" [article], doi:10.1063/1.4922545, n 045102 v 143, The Journal of Chemical Physics, 2015; and commentary: "New Computer Model Could Explain how Simple Molecules Took First Step Toward Life," Newswise, 28 Jul 2015. Cleaves H. James II, Meringer Markus, and Goodwin Jay, "227 Views of RNA: Is RNA Unique in Its Chemical Isomer Space?" [abstract], doi:10.1089/ast.2014.1213, Astrobiology, 7 Jul 2015. Did a puddle in flux spark life on Earth?, Georgia Institute of Technology (+Newswise), 20 Jul 2015. John A. Baross and William F. Martin, "The Ribofilm as a Concept for Life's Origins" [abstract], doi:10.1016/j.cell.2015.06.038, p 13-15 v 162, Cell, 2 Jul 2015. Why 'RNA world' theory on origin of life may be wrong after all by Bob Holmes, New Scientist, 24 Jun 2015. 23 Jun 2015: The Origin of Life Circus, by Suzan Mazur. Scientists find new evidence of key ingredient during dawn of life, University of North Carolina (+SpaceDaily), 18 Jun 2015; and earlier: New evidence emerges on the origins of life on Earth, University of North Carolina (+Newswise), 1 Jun 2015. "Their findings... fly in the face of the problematic 'RNA world' theory...."
Wim Hordijk, "The Living Set", The Scientist, 1 Jun 2015. "Mathematical and computational approaches are making strides in understanding how life might have emerged and organized itself from the basic chemistry of early Earth." Martin Ferus et al., "Meteorite-catalyzed synthesis of nucleosides and other prebiotic compounds" [abstract], doi:10.1073/pnas.1507471112, Proc. Natl. Acad. Sci. USA, online 28 May 2015. Life's Elusive X-Factor?... by Suzan Mazur, Huffington Post, 22 May 2015. "...Nothing much has happened since Miller-Urey yet scientists keep pursuing the same lines of investigation," says biochemist Pier Luigi Luisi. Remembering Origin of Life Trailblazer Harry Lonsdale by Suzan Mazur, Huffington Post, 5 Jan 2015. He died 11 Nov 2014. Dorian S. N. Parker et al., "Gas Phase Synthesis of (Iso)Quinoline and its Role in the Formation of Nucleobases in the Interstellar Medium" [abstract], doi:10.1088/0004-637X/803/2/53, The Astrophysical Journal, 1 May 2015; and commentary: A Hot Start to the Origin of Life? by Kate Greene, Berkeley Lab (+PhysOrg.com), 5 May 2015. A. Roldan et al., "Bio-inspired CO2 conversion by iron sulfide catalysts under sustainable conditions" [Open Access abstract], doi:10.1039/C5CC02078F, Chem. Commun., online 24 Mar 2015; and commentary: Hydrothermal Vents Able to Create Simple Organic Molecules, Sci-News.com, 29 Apr 2015. Christian Mayer, Ulrich Schreiber and María J. Dávila, "Periodic Vesicle Formation in Tectonic Fault Zones—an Ideal Scenario for Molecular Evolution" [abstract], doi:10.1007/s11084-015-9411-z, Origins of Life and Evolution of Biospheres, online 27 Feb 2015. By email, Ulrich writes, "We can show the development of vesicles, peptides (and next nucleotides) under conditions of the upper continental crust (open systems in tectonic fault zones) in super critical CO2. We detected the first organic chemistry in quartz minerals of tectonic fault zones in Archean quartz dykes of Western Australia." The fossil record indicates that there were handheld calculators with at least 240 kilobytes of stored programs in existence almost as soon as the earth cooled. Possibly, handheld calculators originated when special conditions allowed the formation of silicon chips and circuit boards (primitive genes). Heat, perhaps generated by radioactivity, volcanoes or meteor impacts, melted some sand to form a silicon flake. Random splashing of molten metal caused metal filaments to form a circuit board on the flake. Oily film on ponds dried into the hard plastic material needed for the shell. Lightning provided the first source of electrical power. Prototypes in seawater, at just the right distance from the strike, received sufficient voltage without being destroyed. Batteries (allowing independent metabolism) came later. The first batteries were iron acid batteries, formed in mud pockets. Lithium batteries were a very late development. This primitive protocalculator somehow acquired ten to 25 bytes of stored programs (40 to 100 nucleotides) that enabled it to have some function that made it useful. Now we find evidence for only the fully evolved handheld calculators similar to the ones used today, with function keys and lengthy installed programs, because the fossil record is incomplete. How Earth's earliest life overcame a genetic paradox by Tim Wogan, Science News, 30 Jan 2015. "Longer RNA chains could have hidden out in porous rocks near volcanic sites such as hydrothermal ocean vents, where unique temperature conditions might have helped complex organisms evolve." Meredith Root-Bernstein and Robert Root-Bernstein, "The ribosome as a missing link in the evolution of life" [html], doi:10.1016/j.jtbi.2014.11.025, p 130-158 v 367, Journal of Theoretical Biology, 21 Feb 2015. "Cells – and DNA itself – evolved, we argue, to optimise the functioning of ribosomes;" and commentary: Never mind the selfish gene - ribosomes are the missing link, The Conversation (+PhysOrg.com), 7 Jan 2015. Martin Ferus et al., "High-energy chemistry of formamide: A unified mechanism of nucleobase formation" [abstract], doi:10.1073/pnas.1412072111, Proc. Natl. Acad. Sci. USA, online 8 Dec 2014. Jonathan T. Sczepanski and Gerald F. Joyce, "A cross-chiral RNA polymerase ribozyme" [html], doi:10.1038/nature13900, p 440-442 v 515, Nature, 20 Nov (online 29 Oct) 2014; and commentary: ...Scientists Make Enzyme that Could Help Explain Origins of Life, Scripps Research Institute (+PhysOrg.com +Newswise), 29 Oct 2014. David Deamer, "Origin of life: The first spark" (review of In Search of Cell History by Franklin M. Harold, University of Chicago Press: 2014) [html], doi:10.1038/514302a, p 302-303 v 514, Nature, 15 Oct 2014. J.M. Dreiling and T.J. Gay, "Chirally Sensitive Electron-Induced Molecular Breakup and the Vester-Ulbricht Hypothesis" [abstract], doi:10.1103/PhysRevLett.113.118103, n 118103 v 113, Phys. Rev. Lett., 12 Sep 2014; and commentary: Force of nature gave life its asymmetry by Elizabeth Gibney, doi:10.1038/nature.2014.15995, Nature News, 25 Sep 2014. Zerulla K, Chimileski S, Näther D, Gophna U, Papke RT, et al., "DNA as a Phosphate Storage Polymer and the Alternative Advantages of Polyploidy for Growth or Survival" [html], doi:10.1371/journal.pone.0094819, 9(4): e94819, PLoS ONE, 14 Apr 2014; and commentary: DNA may have had humble beginnings as nutrient carrier by Adam Hadhazy, PhysOrg.com, 1 Sep 2014. "DNA might have initially evolved for the purpose of storing phosphate...."
Origin of Life Project: Second Annual Reports, Jul 2014. Stanley Miller's Forgotten Experiments, Analyzed, Georgia Tech (+Newswise), 25 Jun 2014. A New Physics Theory of Life, re: Jeremy England, by Natalie Wolchover, Quanta Magazine, 22 Jan 2014. "...The underlying principle driving the whole process is dissipation-driven adaptation of matter." William F. Martin, Filipa L. Sousa and Nick Lane, "Energy at life's origin" [abstract], doi:10.1126/science.1251653, p 1092-1093 v 344, Science, 6 Jun 2014. "...Suggesting that natural ion gradients in [hydrothermal] vents ignited life's ongoing chemical reaction." Markus A Keller, Alexandra V Turchyn and Markus Ralser, "Non-enzymatic glycolysis and pentose phosphate pathway-like reactions in a plausible Archean ocean" [html], doi:10.1002/msb.20145228, 725 v10, Mol. Syst. Biol., 1 Apr 2014. "These results ...support the hypothesis that the topology of extant metabolic network could have originated from the structure of a primitive, metabolism-like, prebiotic chemical interconversion network"; and commentary: Pier Luigi Luisi, "Prebiotic metabolic networks?" [html], doi:10.1002/msb.20145351, 729 v10, Mol. Syst. Biol., 1 Apr 2014. Tom Froese, Nathaniel Virgo and Takashi Ikegami, "Motility at the Origin of Life: Its Characterization and a Model" [abstract | full text], doi:10.1162/ARTL_a_00096, p 55-76 v 1, Artificial Life, Winter 2014. "...We conclude by speculating about the feasibility of a movement-first approach to the origin of life." Jef Akst, "RNA World 2.0" [html], The Scientist, 1 Mar 2014. Jimmy Gollihar, Matthew Levy and Andrew D. Ellington, "Many Paths to the Origin of Life" [summary], doi:10.1126/science.1246704, p 259-260 v 343, Science, 17 Jan 2014. Katarzyna Adamala and Jack W. Szostak, "Nonenzymatic Template-Directed RNA Synthesis Inside Model Protocells" [abstract], doi:10.1126/science.1241888, p 1098-1100 v 342, Science, 29 Nov 2013; and commentary: Robert F. Service, "The Life Force" [intro], doi:10.1126/science.342.6162.1032, p 1032-1034 v 342, Science, 29 Nov 2013. "'Laboratories will be creating a living cell within ten years,' Colin Pittendrigh, an American biologist, predicted in 1967." Ancient Minerals: Which Gave Rise to Life?, Carnegie Institution for Science (+PhysOrg.com), 25 Nov 2013. ...Further evidence of 'RNA world' origin in modern life, The University of Chicago Medicine (+PhysOrg.com), 6 Nov 2013. Clay May Have Been Birthplace of Life On Earth..., ScienceDaily (+Newswise.com), 5 Nov 2013. Paleontologist Presents Origin of Life Theory, Texas Tech University (+PhysOrg.com +Newswise.com), 29 Oct 2013. "This is what we've all searched for - the Holy Grail of science." Li Li, Christopher Francklyn and Charles W. Carter Jr., "Aminoacylating Urzymes Challenge the RNA World Hypothesis" [abstract | editor's comment], doi:10.1074/jbc.M113.49612, p 26856-26863 v 288, The Journal of Biological Chemistry, 13 Sep 2013; and more commentary: New findings challenge assumptions about origins of life, UNC School of Medicine (+PhysOrg.com +Newswise), 13 Sep 2013. "The RNA world hypothesis is extremely unlikely. It would take forever." First Annual Review of Research by the 2011 Winners of the "Origin of Life Challenge", Jul 2013. Roy A. Black et al., "Nucleobases bind to and stabilize aggregates of a prebiotic amphiphile, providing a viable mechanism for the emergence of protocells" [abstract], doi:10.1073/pnas.1300963110, Proc. Natl. Acad. Sci. USA, 30 Jul 2013; and commentary: Natural affinities – unrecognized until now – may have set stage for life to ignite by Sandra Hines, Universty of Washington, 29 Jul 2013. Michael J. Russell et al., "The inevitable journey to being" [abstract], doi:10.1098/rstb.2012.0254, n1622 v368, Phil. Trans. R. Soc. B, 19 Jul 2013; and commentary: Cracking how life arose on Earth may help clarify where else it might exist, PhysOrg.com, 30 Jul 2013. Karl Friston, "Life as we know it" [abstract], doi:10.1098/rsif.2013.0475, n86 v10, J. R. Soc. Interface, 6 Sep (online 3 Jul) 2013. "This paper presents a heuristic proof (and simulations of a primordial soup) suggesting that life—or biological self-organization—is an inevitable and emergent property of any (ergodic) random dynamical system that possesses a Markov blanket." Prebiotic Chemistry: Focus Issue [index with Open Acess links], n5 v5, Nature Chemistry, online 19 May 2013. David E. Bryant et al., "Hydrothermal modification of the Sikhote-Alin iron meteorite under low pH geothermal environments. A plausibly prebiotic route to activated phosphorus on the early Earth" [html], p 90-112 v109, Geochimica et Cosmochimica Acta, 15 May 2013; and commentary: Unusual Extraterrestrial Phosphorus Triggered Origin Of Life - A Key Puzzle May Be Solved!, MessageToEagle.com, 4 Apr 2013. Liam M. Longo et al., "Simplified protein design biased for prebiotic amino acids yields a foldable, halophilic protein" [abstract], doi:10.1073/pnas.1219530110, p2135-2139 v110, Proc. Natl. Acad. Sci. USA, 5 Feb 2013; and commentary: Origins of life? ...New Clues by Doug Carlson, Florida State University (+Newswise), 5 Apr 2013. Origin of Life Souffle Rises by Susan Mazur, TheHuffingtonPost.com, 13 Mar 2013. Christian de Duve, "The Other Revolution in the Life Sciences" [abstract], doi:10.1126/science.339.6124.1148-a, p1148 v339, Science, 8 Mar 2013. Before Gilbert's widely publicized "RNA world", there may have been Baltcheffsky's "pyrophosphate world", Wächtershäuser's "iron-sulfur world", or my "thioester world". How did early primordial cells evolve?, PhysOrg.com, 28 Feb 2013. "L-form bacteria become irregularly shaped and form cell surface bulges that pinch off to become daughter cells...."
Molecules Assemble in Water, Hint at Origins of Life, Georgia Institute of Technology, 20 Feb 2013. Origin of life emerged from cell membrane bioenergetics, University College London (+ScienceDaily), 20 Dec 2012. 16 Dec 2012: Two new origin-of-life research programs are proposed. Nilesh Vaidya et al., "Spontaneous network formation among cooperative RNA replicators" [abstract], doi:10.1038/nature11549, p72-77 — and commentary by James Attwater and Philipp Holliger, "Origins of life: The cooperative gene" [abstract], p48-49 — v491, Nature, 1 Nov 2012. Early-Earth Cells Modeled to Show How First Life Forms Might Have Packaged RNA, Penn State University (also EurekAlert! and PhysOrg.com), 14 Oct 2012. The Origin of Life Challenge: Searching for How Life Began by Nola Taylor Redd, Astrobiology Magazine, 20 Jun 2012. 7 Jun 2012: An interview with Gerald Joyce is available on the Internet. 10 May 2012: The definition of life and speculations about its origin(s)... by Gerald Joyce of the Scripps Research Institute. Vitor B. Pinheiro et al., "Synthetic Genetic Polymers Capable of Heredity and Evolution" [abstract], doi:10.1126/science.1217622, p341-344 v336, Science, 20 Apr 2012; and commentary: Molecular alternatives to DNA, RNA offer new insight into life's origins, by Richard Harth, Arizona State University (+PhysOrg.com), 19 Apr 2012. "This pre-RNA world hypothesis has been gaining ground, largely through investigations into XNAs...."
Ulrich Schreiber et al., "Hypothesis: Origin of Life in Deep-Reaching Tectonic Faults" [abstract], doi:10.1007/s11084-012-9267-4, Origins of Life and Evolution of Biospheres, online 29 Feb 2012. "...We suggest that supercritical CO2 as a nonpolar solvent could have played an important role." 31 Mar 2012: Is there life elsewhere? How did life start…? 13 Mar 2012: The standard RNA World theory is disputed following a new phylogenetic analysis. Did Life's First Cells Evolve in Geothermal Pools? by David Biello, Scientific American, 15 Feb 2012. Debate bubbles over the origin of life, doi:10.1038/nature.2012.10024, by Brian Switek, Nature News, 13 Feb 2012. Russian hot springs point to rocky origins for life by Colin Barras, NewScientist, 13 Feb 2012. The search for life's stirrings by Alvin Powell, Harvard University Gazette, 6 Feb 2012. "Nobel Prize winner Jack Szostak's research focuses on understanding primitive cells, how they might have been created, and how they might have behaved and divided." Laurence Burroughs et al., "Asymmetric organocatalytic formation of protected and unprotected tetroses under potentially prebiotic conditions" [abstract], doi:10.1039/C1OB06798B, Organic & Biomolecular Chemistry, online 16 Nov 2011. "...Using simple left-handed amino acids to catalyse the formation of sugars resulted in the production of predominately right-handed form of sugars." Claudia Huber, "Elements of Metabolic Evolution" [abstract], doi:10.1002/chem.201102914, Chemistry - A European Journal, online 13 Jan 2012. A birthplace for primitive life on Earth?, Centre national de la recherche scientifique (CNRS) (+Physorg.com), 18 Oct 2011. "The mud volcanoes at Isua thus represent a particularly favorable setting for the emergence of primitive terrestrial life." David M. J. Lilley and John D. Sutherland, eds., "The chemical origins of life and its early evolution," Discussion Meeting Issue with 17 articles [table of contents], v366 n1580, Phil. Trans. R. Soc. B, 27 Oct 2011. Martin D. Brasier et al., "Pumice as a Remarkable Substrate for the Origin of Life" [abstract], doi:10.1089/ast.2010.0546, p725-735 v11 n7, Astrobiology, Sep 2011. Volcanic rock rafts 'could have been cradles of life' by Mark Kinver, BBC News, 2 Sep 2011. First life may have arisen above serpentine rock... by Max McClure, Stanford University News, 22 Sep 2011. Massimo Di Giulio, "Biological evidence against the panspermia theory" [abstract | early version PDF], doi:10.1016/j.jtbi.2010.07.017, p569-572 v266, Journal of Theoretical Biology, 21 Oct 2010. "The tRNA split genes of Nanoarchaeum equitans and the Met-tRNAfMet->fMet-tRNAfMet pathway are independent, plesiomorphic and domain-specific traits which define a progenotic stage for the LUCA and for the ancestors of Archaea and Bacteria." Thomas R. Cech, "The RNA Worlds in Context" [abstract], doi:10.1101/cshperspect.a006742, Perspectives in Biology, Cold Spring Harbor, online 16 Feb 2011. There are two RNA worlds. First life: The search for the first replicator by Michael Marshall, n2585, New Scientist, 15 Aug 2011. Jason E. Hein et al., "A route to enantiopure RNA precursors from nearly racemic starting materials" [abstract], doi:10.1038/nchem.1108, Nature Chemistry, online 7 Aug 2011. Robert Shapiro, "Astrobiology: Life's beginnings" — review of First Life by David Deamer [html], doi:10.1038/476030a, p30-31 v476, Nature, 4 Aug 2011. David Deamer, First Life: Discovering the Connections between Stars, Cells, and How Life Began [publisher's promo], ISBN:9780520258327, Jun 2011. RNA reactor could have served as a precursor of life by Lisa Zyga, PhysOrg.com, 11 Jul 2011. 4 Jul 2011: A chemist has announced an Origin-Of-Life prize of 50,000 dollars. 26 May 2011: The common ancestor of life on Earth had more functional protein domains than the first cells! Meteorite cargo could solve origin-of-life riddle by Andy Coghlan, NewScientist.com, 01 Mar 2011. Pssst! Don't tell the creationists, but scientists don't have a clue how life began by John Horgan, ScientificAmerican.com, 28 Feb 2011. Andrei S Rodin, Eörs Szathmáry and Sergei N Rodin, "On origin of genetic code and tRNA before translation" [abstract], doi:10.1186/1745-6150-6-14, v6 n14, Biology Direct, 22 Feb 2011. 22 Feb 2011: We'll create panspermia.... — J. Craig Venter at a panel discussion of the origin of life. Clay-Armored Bubbles ...Could Have Played a Key Role in the Origins of Life, ScienceDaily, 7 Feb 2011. Can a Simple Model Explain the Advent of Cells? by Tim Wogan, ScienceNow, 7 Jan 2011. Irene A. Chen, "...An RNA Whirl" (review of Life from an RNA World: The Ancestor Within, by Michael Yarus), [summary], doi:10.1126/science.1197794, p758 v330, Science, 5 Nov 2010. Jason P. Schrum, Ting F. Zhu and Jack W. Szostak, "The Origins of Cellular Life" [abstract], doi:10.1101/cshperspect.a002212, Cold Spring Harb. Perspect. Biol., Sep 2010. Harold J. Morowitz et al., "Ligand Field Theory and the Origin of Life as an Emergent Feature of the Periodic Table of Elements" [abstract], p1-6 v219, The Biological Bulletin, Aug 2010; and commentary -- Transition metal catalysts could be key to origin of life... by Carol Schachinger, EurekAlert.org, 3 Sep 2010. Could thermodynamic fluctuations have led to the origins of life? by Lisa Zyga, Physorg.com, 16 Aug 2010. New Theory for Life's First Energy Source by Zoë Macintosh, LiveScience, 12 Jun 2010. ...Ultraviolet Light Helps Form "Missing G" of RNA Building Blocks by Abby Vogel Robinson, Georgia Institute of Technology (+Newswise), 14 Jun 2010. 20 May 2010: A conversation with Jeffrey L. Bada is available online. 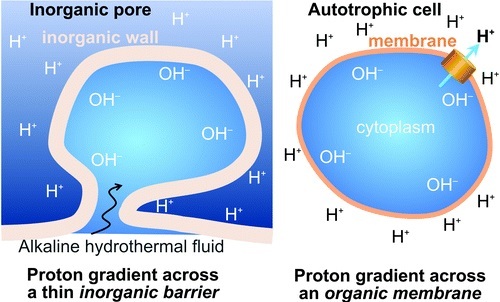 Tu Lee and Yu Kun Lin, "The Origin of Life and the Crystallization of Aspartic Acid in Water" [abstract], doi:10.1021/cg901219f, p1652-1660 v10, Crystal Growth & Design, 27 Feb 2010. Katharine Sanderson, "Comet crash creates potential for life" [html], doi:10.1038/news.2010.152, NatureNews, online 26 Mar 2010. 20 Mar 2010: Molecular Midwives? Shooting Meteorites in a Barrel by Jeremy Hsu, PhysOrg.com, 26 Feb 2010. "High-impact lab experiments simulate whether the building blocks of life could have survived the rough arrival on Earth via meteorite impact." Rebecca M. Turk et al., "Multiple translational products from a five-nucleotide ribozyme" [abstract], doi:10.1073/pnas.0912895107, Proc. Natl. Acad. Sci. USA, online 22 Feb 2010. Also see commentary — CU Team Discovers Tiny RNA Molecule With Big Implications for the Origin of Life, The University of Colorado at Boulder, 22 Feb 2010. New research rejects 80-year theory of 'primordial soup' as the origin of life, PhysOrg.com, 2 Feb 2010. Prussian blue linked to the origin of life, EurekAlert, 14 Dec 2009. "...When Prussian blue is dissolved in ammoniac solutions it produces hydrogen cyanide, a substance that could have played a fundamental role in the creation of the first bio-organic molecules...."
28 Nov 2009: There is no such a thing as a 'simple' bacterium — Howard Ochman and Rahul Raghavan. Charles Darwin really did have advanced ideas about the origin of life, EurekAlert, 27 Oct 2009. Hisashi Ohtsuki and Martin A. Nowak, "Prelife catalysts and replicators" [abstract], doi:10.1098/rspb.2009.1136, p3783-3790 v276, Proc. R. Soc. B, Nov (online 19 Aug) 2009. "We model prelife as a binary soup of active monomers that form random polymers." Anna C. Balazs and Irving R. Epstein, "Emergent or Just Complex?" [summary], doi:10.1126/science.1178323, Science, 25 Sep 2009. "The scope of the conference is exemplified by S. Rasmussen's characterization of hydrogen as 'a colorless, odorless gas, which, given enough time, turns into people.'" UV light and the origin of life is the subject of a Reply from Armen Y. Mulkidjanian pointing us to papers about the Zinc world, 24 Aug 2009. Impressions from the San Sebastian meeting Open Questions in the Origin of Life (OQOL), comments by Pier-Luigi Luisi and Andrew Pohorille, NASA Astrobiology Institute (+SpaceRef.com), 15 Jun 2009. Yasuyuki Ura et al., "Self-Assembling Sequence-Adaptive Peptide Nucleic Acids" [abstract], doi:10.1126/science.1174577, Science, online 11 Jun 2009. Also see a press release: Team Creates Simple Chemical System that Mimics DNA, The Scripps Research Institute, 11 Jun 2009; and commentary: DNA-like Molecule Replicates Without Help, by Robert F. Service, ScienceNOW Daily News, 11 Jun 2009; and Tantalizing clues to the chemical origins of life, by Katharine Sanderson, Nature, online 12 Jun 2009. Antonio Lazcano, "Mind the Gap!," doi:10.1371/journal.pbio.1000122, v 7 n 6: e122, PLoS Biol., 2 Jun 2009: Review of Protocells: Bridging nonliving and living matter, S Rasmussen et al., eds., Cambridge (Massachusetts): MIT Press, 2008. John Whitfield, "Origin of life: Nascence man" [link], doi:10.1038/459316a, p 316-319 v 459, Nature, 21 May 2009. "Like an alchemist of yore, Mike Russell is taking basic elements and trying to transform them — not into gold, but into the stirrings of life...."
RNA world easier to make by Richard Van Noorden, doi:10.1038/news.2009.471, Nature.com, 13 May 2009. Matthew W. Powner et al., "Synthesis of activated pyrimidine ribonucleotides in prebiotically plausible conditions" [abstract | Editor's Summary], doi:10.1038/nature08013, p 239-242 v 459, Nature; and commentary by Jack W. Szostak, "Origins of life: Systems chemistry on early Earth" [html], doi:10.1038/459171a, p 171-172 v 459, Nature, 14 May 2009. Calculating The Odds That Life Could Begin By Chance by Dave Deamer, ScientificBlogging.com, 30 Apr 2009. Tracey A. Lincoln and Gerald F. Joyce, "Self-Sustained Replication of an RNA Enzyme" [abstract], doi:10.1126/science.1167856, Science, online 8 Jan 2009. "Populations of various cross-replicating enzymes were constructed. ...Many such model systems could be constructed...." Also see commentary: The Immortal Molecule, by Mark Schrope, v9 n1, News & Views, Scripps Research Institute, 12 Jan 2009. Carl Zimmer, "On the Origin of Life on Earth" [link], doi:10.1126/science.323.5911.198, p 198-199 v 323, Science, 9 Jan 2009. 23 Dec 2008: Maybe heat-loving prokaryotes are not the oldest form of life. 21 Dec 2008: How ancient organic molecules came together to form the basis of life? Could life have started in a lump of ice?, Physorg.com, via European Science Foundation, 5 Nov 2008. Could These Protocells Tell Us About Earth's Earliest Cells?, Scientific Blogging, 5 Jun 2008. Martin A. Nowak and Hisashi Ohtsuki, "Prevolutionary dynamics and the origin of evolution" [abstract], doi:10.1073/pnas.0806714105, p 14924-14927 v 105, Proc. Natl. Acad. Sci. USA, 30 Sep (online 12 Sep) 2008. "In the present theory ...we encounter natural selection before replication." Scientists develop new method to investigate origin of life, Pennsylvania State University, 2 Sep 2008. Diamonds May Have Jump-Started Life on Earth, by Robert Roy Britt, LiveScience, 26 Jul 2008. David W. Deamer, "Origins of life: How leaky were primitive cells?" [html], doi:10.1038/454037a, p 37-38 v 454, Nature, 3 Jul 2008. "...At some point in the pathway to the first cellular life, such a system must have arisen spontaneously." We question this assumption. Meteorites Delivered the "Seeds" of Earth's Left-hand Life, Newswise.com, 6 Apr 2008. J. Michael McBride and John C. Tully, "Did life grind to a start?" [link], doi:10.1038/452161a, p 161-162 v 452, Nature, 13 Mar 2008. Seafloor Chemistry: Life's building blocks made inorganically, by Sid Perkins, Science News, 2 Feb 2008. Douglas Fox, "Did Life Begin in Ice?" [link], p 52-58, Discover, Feb 2008. 15 Jan 2008: Did life begin on a radioactive beach? New hypothesis for origin of life proposed, re: Helen Hansma, University of California, Santa Barbara, posted on Physorg.com, 4 Dec 2007. "Life may have begun in the protected spaces inside of layers of the mineral mica, in ancient oceans, according to a new hypothesis." Philipp Baaske et al., "Extreme accumulation of nucleotides in simulated hydrothermal pore systems" [abstract], 10.1073/pnas.0609592104, p 9346-9351; and Eugene V. Koonin's commentary [extract], p 9105-9106, v 104, Proc. Natl. Acad. Sci. USA, 29 May 2007. "...Interlinked mineral pores in a thermal gradient provide a compelling high-concentration starting point for the molecular evolution of life." Tiny DNA Molecules Show Liquid Crystal Phases, Pointing Up New Scenario For First Life On Earth, the University of Colorado at Boulder, 22 Nov 2007. Jeremy Pearce, "Leslie Orgel, Biochemist Who Studied Origins of Life, Dies at 80" [text], The New York Times, 5 Nov 2007. Salk Institute's Leslie Orgel Dies at 80 years old, on October 27; by Heather Chambers, San Diego Business Journal, 31 Oct 2007. How Did Chemical Constituents Essential To Life Arise On Primitive Earth?, by Philip Lee Williams, University of Georgia News Service, and on ScienceDaily.com, 31 Oct 2007. Jerry Chancellor alerts us that inorganic dust may make helices under the right conditions in space, 22 Aug 2007. Eric D. Schneider and Dorion Sagan, Into the Cool: Energy Flow Thermodynamics and Life, The University of Chicago Press, 2005, p 163: Here we argue that a thermodynamically forced protometabolism, capable of making homeostatic-like dissipative structures that enjoyed a primitive reproduction, must have preceded precise replication. Rainer Glaser et al., "Adenine Synthesis in Interstellar Space: Mechanisms of Prebiotic Pyrimidine-Ring Formation of Monocyclic HCN-Pentamers" [abstract], 10.1089/ast.2006.0112, p 455-470 v 7, Astrobiology, Jul 2007. Justin A. Bradford and Ken A. Dill, "Stochastic innovation as a mechanism by which catalysts might self-assemble into chemical reaction networks" [abstract], doi:10.1073/pnas.0703522104, p 10098-10103 v 104, Proc. Natl. Acad. Sci. USA, 12 Jun 2007. Scientists propose the kind of chemistry that led to life, Physorg.com, 8 Jun 2007. "...Either a primitive kind of metabolism or an RNA-like duplicating machinery must have set the stage.... But what preceded these pre-life steps?" 29 May 2007: A Simpler Origin for Life is what Robert Shapiro claims to explain in Scientific American. Stanley L. Miller dies, by Kelly Rae Chi, The Scientist, 24 May 2007. RNA enzyme structure offers a glimpse into the origins of life, Physorg.com, 15 Mar 2007. Programming the Universe: A Quantum Computer Scientist Takes On the Cosmos, by Seth Lloyd, Alfred A. Knopf/Jonathan Cape: 2006; reviewed by Artur Ekert, "The Universe's quantum monkeys" [text], 10.1038/445366a, p 366-367 v 445, Nature, 25 Jan 2007. 9 Nov 2006: Harvard's Origins of Life program held its inaugural symposium, 8 Nov 2006. On the Origins of Life, by David Berlinski, first published in Commentary, 14 Feb 2006. "Why should self-replicating RNA molecules have been common 3.6 billion years ago when they are impossible to discern under laboratory conditions today?" Arthur L. Weber and Sandra Pizzarello, "The peptide-catalyzed stereospecific synthesis of tetroses: A possible model for prebiotic molecular evolution" [abstract], 10.1073/pnas.0602320103, Proc. Natl. Acad. Sci. USA, online 11 Aug 2006. "Because peptides might have formed readily on the early Earth, it is possible that their catalytic contribution was relevant in the prebiotic processes that preceded the onset of life." Kalin Vetsigian, Carl Woese and Nigel Goldenfeld, "Collective evolution and the genetic code" [abstract], 10.1073/pnas.0603780103, Proc. Natl. Acad. Sci. USA, online 3 Jul 2006. "...a variety of collective, but non-Darwinian, mechanisms... generically lead to refinement and selection of innovation-sharing protocols, such as the genetic code.... before the emergence of vertical descent." 17 May 2006: A stupendously improbable accident is Robert Shapiro's characterization of the RNA World. Methane-Belching Bugs Inspire a New Theory of the Origin of Life on Earth, Penn State; also posted by Physorg.com, 12 May 2006. Original article by James G. Ferry and Christopher H. House, "The Stepwise Evolution of Early Life Driven by Energy Conservation" [abstract], 10.1093/molbev/msk014, p 1286-1292 v 23, Molecular Biology and Evolution, Jun (online 31 Mar) 2006. 'Accelerated Evolution' Converts RNA Enzyme to DNA Enzyme In Vitro, by Eric Sauter, News & Views, The Scripps Research Institute, 27 Mar 2006. 13 Feb 2006: Origin-of-life theory comes up short, according to David Deamer. S. D. Senanayake and H. Idriss, "Photocatalysis and the origin of life: Synthesis of nucleoside bases from formamide on TiO2(001) single surfaces" [abstract], 10.1073/pnas.0505768103, Proc. Natl. Acad. Sci. USA, online 19 Jan 2005. "...Some minerals in the form of oxide semiconductors are active materials for making high-molecular-weight organic molecules that may have acted as precursors for biological compounds...."
John Whitfield, "Base Invaders" [link], doi:10.1038/439130a, p 130-131 v 439, Nature, 12 Jan 2006. "Could viruses have invented DNA as a way to sneak into cells?" Ronald Breaker, "Journal Club," p 399 v 438, Nature, 24 Nov 2005. "As a supporter of [The RNA World] theory.... [I] suspect that ancient organisms had a bumpy evolutionary ride until proteins emerged...."
NSF Grant Awarded to SFI to Study How Life Emerged on Earth, Santa Fe Institute, 18 Oct 2005. Paul Davies, "A quantum recipe for life" [text], doi:10.1038/437819a, p 819 v 437, Nature, 6 Oct 2005. Illinois Researchers To Play Key Roles In Study Of Emergence Of Life (popups), TerraDaily, 29 Sep 2005. 22 Sep 2005: Genesis, a new book about the origin of life, ignores the software problem. Ádám Kun, Mauro Santos and Eörs Szathmáry, "Real ribozymes suggest a relaxed error threshold" [abstract], doi:10.1038/ng1621, p 1008-1011 v 37, Nature Genetics, online 28 Aug 2005. Scientists ...point to 'hot soup' at the origin of life, University of Bath, 2 Aug 2005. Alexander V. Vlassov et al., "The RNA World on Ice: A New Scenario for the Emergence of RNA Information" [abstract], doi:10.1007/s00239-004-0362-7, Journal of Molecular Evolution, online 21 Jul 2005. 22 Apr 2005: Jeffrey Bada is optimistic about the origin-of-life problem. pdf: How Do Biological Systems Originate?, by Norman R. Pace, abstract of lecture at NAI Conference, 12 Apr 2005. William R. Taylor, "Does changing the direction of replication make RNA life viable?" doi:10.1038/434705a, p 705 v 434, Nature, 7 Apr 2005. Eörs Szathmáry, "In search of the simplest cell" [text], doi:10.1038/433469a, p 469-470 v 433, Nature, 3 Feb 2005. "Lipid world"? Antonio Lazcano, "An Answer in Search of a Question" [review of William Day's How Life Began], p 469-471 v 4, Astrobiology, 2004. Day endorses Wächtershäuser, but Lazcano doubts that life can begin without genetic material. ...Volcanic Gas May Have Played a Significant Role in the Origins of Life on Earth, by Jason Socrates Bardi, Scripps Research Institute, 11 Oct 2004. 28 Sep 2004: Nova explains the origin of life. Battle of the Bubbles May Have Sparked Evolution, Howard Hughes Medical Institute, 3 Sep 2004. Man who helped unlock DNA dies (Francis Crick, age 88), BBC News, 29 July 2004. Carl Zimmer, "What Came Before DNA?" [intro], p 34-41 v 25 n 6 Discover, June 2004. "Scientists may soon reveal how life began on Earth — by creating a primordial organism in the lab." Molecular midwives hold clues to the origin of life, Georgia Institute of Technology Research News, 31 Mar 2004. "Small, simple molecules acted as templates for the production of the first RNA-like molecules." 13 Feb 2004: Nonliving to living? A. Ricardo, M. A. Carrigan, A. N. Olcott and S. A. Benner, "Borate Minerals Stabilize Ribose" [text], p 196 v 303 Science, 9 Jan 2004. See also: UF study suggests life on Earth sprang from borax minerals, EurekAlert!, 8 Jan 2004. Jack Lucentini, "Darkness Before the Dawn - of Biology" [text], p 28 v 17 The Scientist, 1 Dec 2003. "...First cells would have had to divide or bud and, at the same time, pass on a code for growth and maintenance...". Biology's Theme Park: RNA World, by David Bartel, Astrobiology Magazine, 2 Sep 2003. "Life was a garbage bag." New clues to identity of first genetic molecule, NewScientist.com, 27 July 2003. "TNA could be a long-lost precursor to RNA." Origin of Life, Gordon Research Conference, Bates College, Maine, 13-18 July 2003. UV light may have sparked life on Earth, NewScientist.com, 28 May 2003. "...A new mathematical model implies the radiation actually helped select out the molecular seeds of life." 2003, May 8: ...Huygens Probe [with ESA's comments about "primeval soup"]. 2002, Dec 24: Life's Origin, J. William Schopf, ed. "Binary" Enzyme Created By Scripps Scientists Demonstrates Darwinian Evolution At Its Simplest, ScienceDaily, 19 Dec 2002. "It is possible to have a genetic system of molecules capable of undergoing Darwinian evolution with only two distinct subunits." New theory for origin of life, by John Whitfield, Nature ScienceUpdate, 4 Dec 2002. "Mineral cells might have incubated first living things." 2002, August 19: New evolution theory is survival by gene sharing. Were the first macromolecules created on a primitive beach?, by Joanna Gibson, John Wiley and Sons, 19 June 2002. Ponds, not oceans, the cradle of life, by Matt Kaplan, New Scientist, 9 May 2002. Michael Hagmann, "Günter Wächtershäuser Profile..." [summary], p 2006-2007 v 295 Science, 15 Mar 2002. Joseph L. Kirschvink and Benjamin P. Weiss, "Mars, Panspermia, and the Origin of Life: Where Did It All Begin?" [html | pdf], v4 n2 Palaeontologia Electronica, Jan 2002. Cells from Scratch, by Maia Szalavitz, HMSBeagle, 31 August 2001 [Registration required]. Study Offers Insights into Evolutionary Origins of Life; Artificial Enzyme Able to Synthesize RNA, Whitehead Institute, 17 May 2001. "We will never be able to prove the existence of the RNA world because we can't go back in time—but we can examine the basic properties of RNA and see if these are compatible within the RNA world scenario." Reflections From a Warm Little Pond, by David Pacchioli, SpaceDaily.com, 10 May 2001. Lightly reviews the development of RNA World theory. Robert M. Hazen et al., "Selective adsoption of L-and D-amino acids on calcite: Implications for biochemical homochirality" [abstract], PNAS, 1 May 2001. "A plausible geochemical mechanism for the production of homochiral polypeptides on the prebiotic Earth." Robert M. Hazen, "Life's Rocky Start," p 76-85 v 284 n 4 Scientific American, April 2001. A major plug for minerals as scaffolding for the first genetic material. No mention of a source for the instructions in the genetic material. Found in sequence space, by John Whitfield, Nature Science Update, 5 April 2001. TNA World, NASA Astrobiology Institute, 12 March 2001. 2001, January 29: "NASA Scientists Find Clues That Life Began in Deep Space." 2000, November 17: The TNA World. Günter Wächtershäuser, "Life as We Don't Know It" [summary], p 1307 v 289 Science, 25 August 2000. The "iron-sulfer world" gets a new plug. 2000, August 8: A reply from Stephen Sowerby elaborates on a mineral template mechanism. Did droplets high in the atmosphere give birth to the first living cells?, by Joanna Marchant, New Scientist, 15 July 2000. Life, but not as we know it, by Henry Gee, Nature Science Update, 27 June 2000. Nicholas Wade, "Genetic Analysis Yields Intimations of a Primordial Commune" [text], The New York Times, 13 June 2000. Ancient Organisms Born in Undersea Inferno A 'medieval version of hell' as cradle of life, San Francisco Chronicle, 8 June 2000. Scientists At The Weizmann Institute Propose A New Theory To The Mystery Of The Origin Of Life, Weizmann Institute of Science, 5 June 2000. Darwin's Soup And The Origins of Life — review of The Spark of Life by Christopher Wills and Jeffrey Bada. Previous theories "circle maddeningly around the problem without ever quite coming to grips with it." SpaceDaily, 3 May 2000. New calculations show life's origins possible in volcanic gases — another new theory, EurekAlert!, 27 March 2000. The Origin of Life at britannica.com. One of the four listed hypotheses is, "Life is coeternal with matter and has no beginning; life arrived on the Earth at the time of the origin of the earth or shortly thereafter." Stephen J. Freeland, Robin D. Knight and Laura F. Landweber, "Do Proteins Predate DNA?" p 690-692 v 286 Science, 22 October 1999. "How close are scientists to knowing the origin of life on earth? When, if ever, will we be able to explain the origin of life in purely scientific terms?" [blog link], ScientificAmerican.com, 21 October 1999. Examining life's building blocks, by Alan Boyle, MSNBC, 30 July 1999. "Astronomers and biochemists have found new evidence to back up their assorted scenarios for the origin of life on Earth." 1999, May 18: Biochemist Robert Shapiro advocates a "Life Principle" for the origin of life from nonlife. 1999, April 24: Cytosine is unlikely to have been available for the origin of life. Nicholas Wade, "Inside the Cell, Experts See Life's Origin" The New York Times, 6 April 1999. Commenting on the new edition of The RNA World from Cold Spring Harbor Laboratory Press, Wade writes, "Much has been learned about RNA since the book's first edition in 1993, yet the new knowledge, rather than bolstering the theory of RNA's leading role, seems to accentuate its difficulties." 1999, February 19: NASA says astrobiologists find clues to origin of life. 1998, July 28: Carl R. Woese says lateral gene transfer is more important than vertical inheritance at first. And he discards the notion of a "last common ancestor," which serves as the North Star for neo-Darwinism. .2. Karl R. Popper, "Reduction and the Essential Incompleteness of All Science," p 259-284, Studies in the Philosophy of Biology, Francisco Jose Ayala and Theodosius Dobzhansky, eds. University of California Press, 1974. p 271. .5. Robert Roy Britt, "The Search for the Scum of the Universe," Space.com, 21 May 2002. .6. Dennis Overbye, "Adventure or Inquiry? Two Visions of Cosmic Destiny" [text], The New York Times, 3 Feb 2004. 1. James D. Watson, "Prologue: Early Speculations and Facts about RNA Templates," The RNA World, R.F. Gesteland and J.F. Atkins, eds. Cold Spring Harbor Laboratory Press, 1993. p xxiii. 2. Thomas R. Cech, "A model for the RNA-catalyzed replication of RNA" [abstract], p 4360-4363 v 83, Proc. Nat. Acad. Sci., USA, 1986. 3. Walter Gilbert, "The RNA world" [link], p 618 v 319, Nature, 1986. 4. Eric H. Eckland, Jack W. Szostak and David P. Bartel, "Structurally Complex and Highly Active RNA Ligases Derived from Random RNA Sequences" [abstract], doi:10.1126/science.7618102, p 364-370 v 269, Science, 21 July 1995. 5. Gerald F. Joyce, and Leslie E. Orgel, "Prospects for Understanding the Origin of the RNA World," p 1-25, The RNA World, R.F. Gesteland and J.F. Atkins, eds. Cold Spring Harbor Laboratory Press, 1993. 6. F. H. C. Crick and L. E. Orgel, "Directed Panspermia" [public access pdf], p 341-346 v 19, Icarus, 1973. 7. Francis Crick, Life Itself, Simon and Schuster, 1981. 8. Francis Crick, "Foreword," p xi-xiv, The RNA World, R.F. Gesteland and J.F. Atkins, eds. Cold Spring Harbor Laboratory Press, 1993. p xiii. 9. Leslie E. Orgel, "The Origin of Life on the Earth," p 77-83, Scientific American, October 1994. 10. D. DeVincenzi, ed. "Final Report," Astrobiology Workshop at NASA Ames Research Center. December 1996. 11. Periannan Senapathy, Independent Birth of Organisms, Madison, WI. Genome Press, 1994. 11.5. Manfred Eigen, Steps Towards Life: A Perspective on Evolution (German edition, 1987), Oxford University Press, 1992. p 31. 12. Freeman J. Dyson, Origins of Life, Cambridge University Press, 1985. 13. A. G. Cairns-Smith, Seven Clues to the Origin of Life, Cambridge University Press, 1985. 14. Günter von Kiedrowski, "Primordial soup or crêpes?" p 20-21 v 381, Nature, 2 May 1996. 14.5. Joseph V. Smith, "Biochemical evolution. I. Polymerization on internal, organophilic silica surfaces of dealuminated zeolites and feldspars" [abstract], p 3370-3375 v 95, Proc. Nat. Acad. Sci. USA, 31 Mar 1998. Also see How did life begin? Biochemical evolution on mineral surfaces, The University of Chicago News. 15. Harold J. Morowitz, Beginnings of Cellular Life: Metabolism Recapitulates Biogenesis, Yale University Press, 1992. 16. Carl Zimmer, "First Cell," p 70-78 v 16 n 11, Discover. 17. Harold J.Morowitz, Bettina Heinz and David W. Deamer, "The Chemical Logic of a Minimum Protocell," p 281-287 v 18, Origins of Life and Evolution of the Biosphere, 1988. 18. Jeffrey L. Bada, "Cold Start," p 21-25, The Sciences May/June 1995. 19. Jeffrey L. Bada, "The Organic Chemistry of the Early Earth," presented to the American Association for the Advancement of Science, February 20, 1994. 19.5. Claudia Huber and Günter Wächtershäuser, "Peptides by Activation of Amino Acids with CO on (Ni,Fe)S Surfaces: Implications for the Origin of Life," p 670-672 v 281, Science, 31 July 1998. Also see commentary by Gretchen Vogel, "A Sulfurous Start for Protein Synthesis?" p 627. 19.6. Nicholas Wade, "Experiment Supports Theory That Life Began in Volcanic Environment," The New York Times, 31 July 1998. 19.7. Kenneth Chang, "Cooking Up Life's Origins," ABCNEWS.com, 30 July 1998. 19.8. Thomas Gold, "The Deep, Hot Biosphere", July 1992. 20. Stuart Kauffman, At Home in the Universe, Oxford University Press, 1995. p 45. 21. Christof Böhler, Peter E. Nielsen and Leslie E. Orgel, "Template switching between PNA and RNA oligonucleotides," p 578-581 v 376, Nature, 17 August 1995. 21.5. Lynn Margulis, interviewed in The End of Science, by John Horgan. Addison-Wesley Publishing Company, Inc., 1996. p 140-141. 22. Gerald F. Joyce, "The Rise and Fall of the RNA World," p 339-407 v 3, The New Biologist, 1991. 23. Stephen Jay Gould, Wonderful Life: The Burgess Shale and the Nature of History, W.W. Norton and Company, 1989. p 58. 24. Jeffrey L. Bada, "Talk of the Nation: Science Friday." National Public Radio. 15 September 1995. 25. S. J. Mojzsis, G. Arrhenius, K.D. McKeegan, T.M. Harrison, A.P. Nutman and R.L. Friend, "Evidence of life on earth before 3,800 million years ago," p 55-59 v 384, Nature, 7 November, 1996. See also comentary by Henry Gee, and additional discussion and references at Life Before 3850 Million Years Ago?, this website, first posted November 7, 1996. 26. Francis Crick, "Foreword," p xi-xiv, The RNA World, R.F. Gesteland and J.F. Atkins, eds. Cold Spring Harbor Laboratory Press, 1993. p xiv. 27. Peter B. Moore, "Ribosomes and the RNA World," p 119-135, The RNA World, R.F. Gesteland and J.F. Atkins, eds. Cold Spring Harbor Laboratory Press, 1993. p 131. 28. François Jacob, Of Flies Mice and Men (translated by Giselle Weiss), Harvard University Press, 1998. p 21. Balter, Michael. "Did Life Begin in Hot Water?" p 31 v 280, Science, 3 April 1998. Baserga, Susan J. and Joan A. Steitz. "The Diverse World of Small Ribonucleoproteins," p 359-381, The RNA World, R.F. Gesteland and J.F. Atkins, eds. Cold Spring Harbor Laboratory Press, 1993. Benner, Steven A.; Andrew D. Ellington and Andreas Tauer. "Modern metabolism as a palimpsest of the RNA world," p 7054-7058, Proceedings of the National Academy of Sciences, USA v 86. September 1989. Brack, André (ed. ), The Molecular Origins of Life: Assembling Peices of the Puzzle, Cambridge University Press, 1998. Cech, Thomas R. "RNA as an Enzyme," Scientific American, November, 1986. Cech, Thomas R. "Structure and Mechanism of the Large Catalytic RNAs: Group I and Group II Introns and Ribonuclease P," p 239-269, The RNA World, R.F. Gesteland and J.F. Atkins, eds. Cold Spring Harbor Laboratory Press, 1993. Cohen, Jon. "Novel Center Seeks to Add Spark to Origins of Life," p 1925-1926 v 270, Science, 22 December 1995. Crick, Francis. "Split genes and RNA Splicing," p 264-271 v 204, Science, 20 April 1979. Deamer, David W. and Gail R. Fleischaker, Origins of Life: The Central Concepts, Jones and Bartlett Publishers, 1994.
de Duve, Christian. "The chemical origin of life," p 391-400, Astronomical and Biochemical Origins and the Search for Life in the Universe, Cristiano Batalli Cosmovici, Stuart Bowyer and Dan Werthimer, eds. Editrice Compositori, 1997. Doolittle, Russell F. "Probability and the Origin of Life," p 85-97, Scientists Confront Creationism, Laurie R. Godfrey, ed. W. W. Norton and Company, 1983. Ellington, Andrew D. "Experimental Testing of Theories of an Early RNA World," p 646-664 v 224, Methods in Enzymology, 1993. Ferris, James P. "Prebiotic Synthesis: Problems and Challenges," p 29-35, Cold Spring Harbor Symposia on Quantitative Biology, Volume LII: Evolution of Catalytic Function, Cold Spring Harbor Laboratory, 1987. Ferris, James P. "Life at the Margins," p 659 v 373, Nature, 23 February 1995. Ferris, James P.; Aubrey R. Hill, Jr.; Rihe Liu and Leslie Orgel. "Synthesis of long prebiotic oligomers on mineral surfaces," p 59-61 v 381, Nature, 2 May 1996. Galtier, Nicolas; Nicolas Tourasse and Manolo Gouy. "A Nonhyperthermophylic Common Ancestor to Extant Life Forms," p 220-221; and commentary by Gretchen Vogel, "RNA Study Suggests Cool Cradle of Life," p 155-156 v 283, Science, 8 January 1999. Horgan, John. "Life, Life Everywhere," Scientific American, November 1996. Hotz, Robert Lee. "Probing the Chemistry of Creation," Los Angeles Times, 15 May 1997. Joyce, G. F. "Nonenzymatic Template-directed Synthesis of Informational Macromolecules," p 41-51, Cold Spring Harbor Symposia on Quantitative Biology, Volume LII: Evolution of Catalytic Function, Cold Spring Harbor Laboratory, 1987. Keefe, Anthony D.; Gerald L. Newton and Stanley L. Miller. "A possible prebiotic synthesis of pantetheine, a precursor to coenzyme A," p 683-685 v 373, Nature, 23 February 1995. Keller, M.; E. Blöchl; G. Wächtershäuser and K. O. Stetter. "Formation of amide bonds without a condensation agent and implications for origin of life," p 836-838 v 368, Nature, 28 April 1994. Lazcano, Antonio and Stanley L. Miller. "How Long Did It Take for Life to Begin and Evolve to Cyanobacteria?" p 546-554 v 39, Journal of Molecular Evolution, 1994. Lee, David H., Juan R. Granja, Jose A. Martizez, Kay Severin and M. Reza Ghardi. "A self-replicating peptide," p 525-528 v 382, Nature, 8 August 1996. Lewis, Ricki. "Primordial Soup Researchers Gather at Watering Hole," p 1034-1035 v 277, Science, 22 August 1997. Luisi, Pier Luigi. "Self-reproduction of chemical structures and the question of the transition to life," p 461-468, Astronomical and Biochemical Origins and the Search for Life in the Universe, Cristiano Batalli Cosmovici, Stuart Bowyer and Dan Werthimer, eds. Editrice Compositori, 1997. Maddox, John. "Origin of life by careful reading," p 409 v 367, Nature, 3 February 1994. Maddox, John. "RNA in primaeval genetics," p 29-30 v 372, Nature, 3 November 1994. Maynard Smith, John and Eörs Szathmáry, The Major Transitions in Evolution, W. H. Freeman and Company, Limited, 1995. Oparin, A. I. "Evolution of the Concepts of the Origin of Life, 1924-1974," p 3-8 v 7, Origins of Life, 1976: A lecture read at the International Seminar, "Origin of Life," Moscow, U.S.S.R., 2-7 August 1974. Oparin, A. I., The Origin of Life On Earth, 3rd edition, Academic Press Inc., Publishers, 1957. Orgel, Leslie E. "Evolution of the Genetic Apparatus: A Review," p 9-16, Cold Spring Harbor Symposia on Quantitative Biology, Volume LII: Evolution of Catalytic Function, Cold Spring Harbor Laboratory, 1987. Orgel, Leslie E., The Origins of Life: Molecules and Natural Selection, John Wiley and Sons, Inc., 1973. Orò, J.; T. Mills and A. Lazcano. "Comets and the Formation of Biochemical Compounds on the Primitive Earth - A Review," p 267 - 277 v 21 n 5-6, Origins of Life and Evolution of the Biosphere, 1991–1992. Pennisi, Elizabeth. "Seeking Life's Bare (Genetic) Necessities," p 1098-1099 v 272, Science, 24 May 1996. Piccirilli, Joseph A. "RNA seeks its maker," p 548-549 v 376, Nature, 17 August 1995. Poole, Anthony M.; Daniel C Jeffares and David Penny. "The Path from the RNA World," p 1-17 v 46, Journal of Molecular Evolution, 1998. Rizzotti, Martino. "Did a precellular RNA world ever exist?" p 477-482, Astronomical and Biochemical Origins and the Search for Life in the Universe, Cristiano Batalli Cosmovici, Stuart Bowyer and Dan Werthimer, eds. Editrice Compositori, 1997. Robertson, Hugh D. "Life Before DNA," p 1479-1480 v 264, Science, 3 June 1994. Robertson, Hugh D. "How Did Replicating and Coding RNAs First Get Together?" p 66-67 v 274, Science, 4 October 1996. Robertson, Michael P. and Stanley L. Miller. "Prebiotic Synthesis of 5-Substituted Uracils: A Bridge Between the RNA World and the DNA-Protein World," p 702-705 v 226, Science, 5 May 1995. Rose, George D. "No Assembly Required," p 26-31 v 36 n 1, The Sciences, January / February 1996. Schidlowski, M. "The Beginnings of Life on Earth: Evidence from the Geological Record," p 389-414, The Chemistry of Life's Origins, J.M. Greenberg, C.X. Mendoza-G=mez and V. Pirronello, eds. Kluwer Academic Publishers, 1993. Schwemmler, Werner, Reconstruction of Cell Evolution: A Periodic System, CRC Press, 1984. (Original German edition, 1979). Schwartz, A.W. "Biology and Theory: RNA and the Origin of Life," p 323-344, The Chemistry of Life's Origins, J.M. Greenberg, C.X. Mendoza-G=mez and V. Pirronello, eds. Kluwer Academic Publishers, 1993. Senapathy, Periannan. "Introns and the Origin of Protein-Coding Genes," p 1366-1367 v 268, Science, 2 June 1995. Stein, Wilfred and Francisco J. Varela, eds., Thinking About Biology, Addison-Wesley Publishing Company, 1993. Wade, Nicholas. "Amateur Shakes Up Ideas on Recipe for Life," p B9, B12, The New York Times, 22 April 1997. Waldrop, M. Mitchell. "Did Life Really Start Out in an RNA World?" p 1248-1249 v 246, Science, 8 December 1989. Wills, Peter. "Turning the Corner on the Search for the Origin of Life," p 14-17 v 12 n 2, SFI Bulletin, Summer 1997. Woese, Carl R. and Norman R. Pace. "Probing RNA Structure, Function, and History by Comparative Analysis," p 91-117, The RNA World, R.F. Gesteland and J.F. Atkins, eds. Cold Spring Harbor Laboratory Press, 1993. Wright, Martin C and Gerald F. Joyce. "Continuous in Vitro Evolution of Catalytic Function," p 614-617 v 276, Science, 25 April 1997. Yang, Jian; Steven Zimmerly; Peter Perlman and Alan M. Lambowitz "Efficient integration of an intron RNA into double-stranded DNA by reverse splicing," p 332-335 v 381, Nature, 23 May 1996. Yockey, Hubert P., Information theory and molecular biology, Cambridge University Press, 1992. Zaug, Arthur J. and Thomas R. Cech. "The Intervening Sequence RNA of Tetrahymena Is an Enzyme," p 470-475 v 231, Science, 1986. Zhang, Biliang and Thomas R. Cech. "Peptide bond formation by in vitro selected ribozymes," p 96-100 v 390, Nature, 6 November 1997. The RNA World and the Origins of Life, excerpted from Molecular Biology of the Cell, 4th ed, 2002. The Origin of Life on Earth by Leslie E. Orgel. Scientists Debate RNA's Role At Beginning Of Life On Earth by Ricki Lewis, The Scientist, 31 March 1997. Molecular "Fossils" Of Early Life: Yale Scientists Recreate Molecular "Fossils," Now Extinct, That May Have Existed At The Beginning Of Life, EurekAlert, 5 June 1998. Related Websites: The origin of life "in the first place"
The Mystery of Life's Origin: a well-researched 1984 book with a creationist conclusion. From Primordial Soup to the Prebiotic Beach, an interview with Dr. Stanley L. Miller, October 1996. Origin of Life Research (Glasgow), yet another origin-of-life theory, from the University of Glasgow.